The Camels JV Boys Soccer Team finished second at the Brossart Tournament over the weekend. They played two games, with one win and one loss. With this being one of the hottest weekends of the year, we are very proud of the boys. 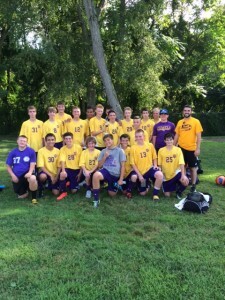 On Friday evening, the boys played Brossart and lost 2-0. The boys could not seem to get a flow going throughout the game and finished with the loss. The game on Sunday afternoon was much better. With the temperature over 100 degrees, the boys put on the pressure early and often against NCC. They played more possession soccer and the Breds couldn’t handle that style. Adam Clark scored 3 first half goals to put the Camels out of reach. The final score was 3-0, allowing the boys to take 2nd in the tournament. There is still work to be done and everyone is excited to get the week going well on Tuesday at Cooper. GO CAMELS!